Living in Goa roots me, albeit infuriatingly, in the domestic and mundane. This, along with being so far from the hulchul of living in a metropolis means that the quieter, quasi-rural life-style is seeping into me. A three-day Lit Fest (GALF)and friends visiting the weekend before, plus multiple rounds of the RTO to renew my driving licence, sent my back out of gear such that I missed out on the first few days of The Serendipity Arts Festival, 2018 edition. But, I rested, sorted it out and went on Day 6, almost at the close of the fest. Although miffed at having such little time to take in all that was offered in terms of art, craft, dance, music, drama and more, I was quite pleased with this late start when I realized there were fewer people, so no jostling for viewing space as one did last year, at the onset of these events. My first stop was Ribandar, to see part of an exhibition housed in a 17th century church –‘The Sacred Everyday: Embracing the Risk of Difference’. 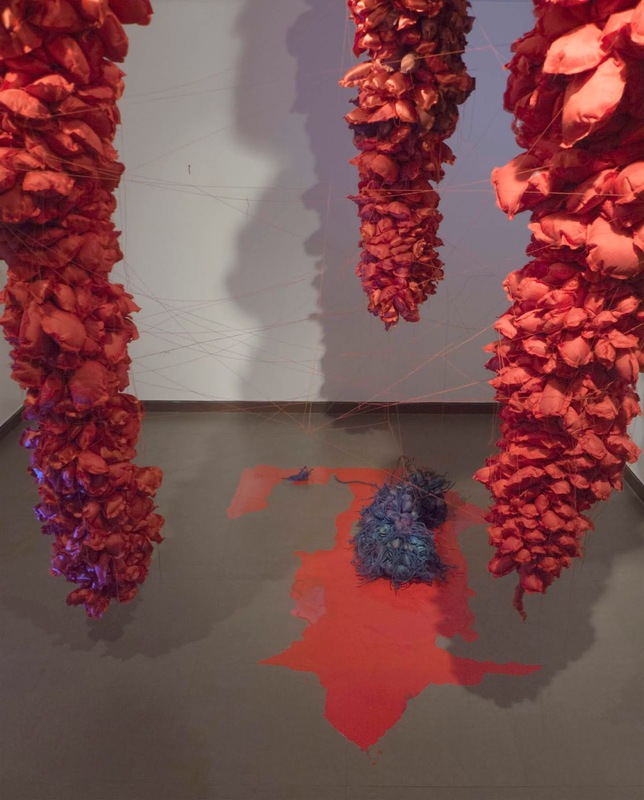 “An exploration of the interrelationship between the divine, cosmic and sublime, and the realm of the human intimate and the domestic”, had been curated by Ranjit Hoskote. His near exhaustive presentation spanned large galleries that took one along the estuary of the River Mhadei or Mandovi flowing into the Arabian Sea. It was showcased partly at the Church of Santa Monica in Ribandar and the Adil Shah Palace in Panjim. Driving alongside the river at low tide with exposed mangrove roots and lots of birds in view, on a sunny December afternoon, I knew I'd made the right decision to keep the urbaneness of Panjim for later. Carrying forth the serenity of a week of relative silence and healing, I approached the painted, white, fortress-like façade with its unusually wide and unadorned buttresses, walking under them into the basilica (named after St. Augustine's mother) with its high-vaulted ceiling and decoratively painted stone pulpit, to begin my exploration of what emerged as a curatorial feat. Known particularly for the miraculous Weeping Cross, the Church of Santa Monica also houses the Museum of Christian Art, currently under extended renovation. Therefore the nave itself was the site for one section of this exposition. Nestled in the curves of the undulating, hilly landscape and serene surroundings, with the silence of worshipfulness inaudibly reverberating inside the vaulted sanctorum, the blessedness of the location created a sense of awe in viewing. 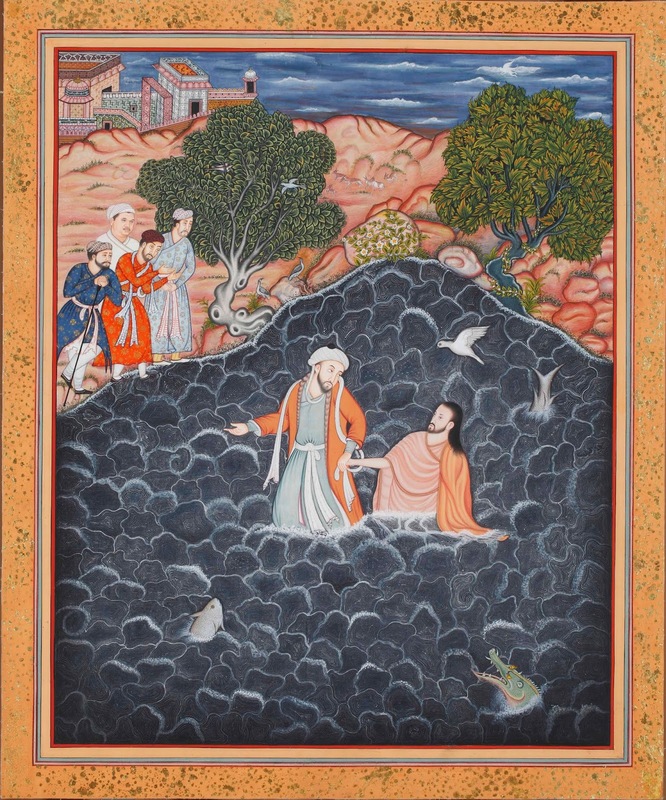 The most significant work in this segment of ‘The Sacred Everyday’ art exhibits, was the work by Manish Soni, a contemporary miniature painter from Rajasthan whose family hail from the lineage of the legendary Badrilal Chitrakar. 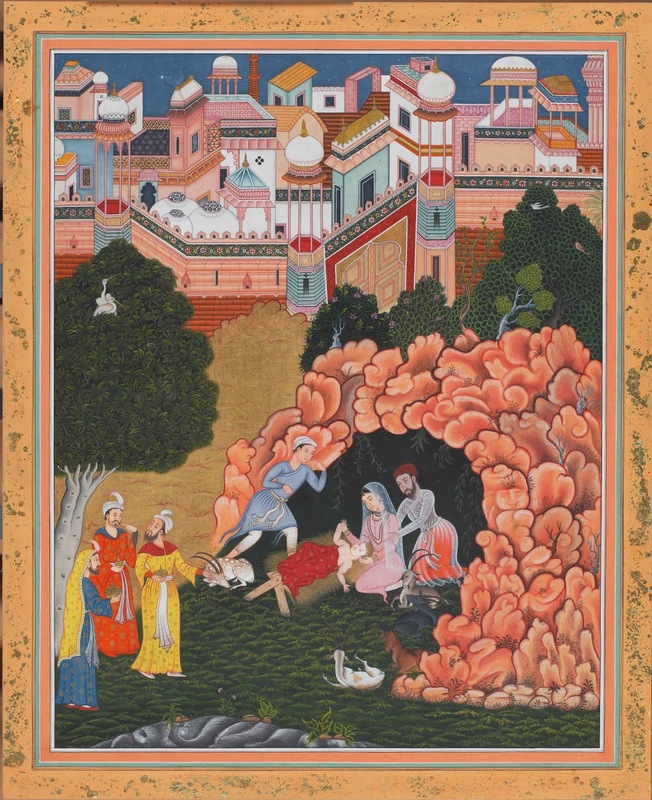 Soni's rendition of the ‘Issanama’ (Story of Christ) had been produced in collaboration with Paul Abraham of the Sarmaya Arts Foundation and was, rather ironically, inspired by the chronicle of adventures of Hamza and his men battling the enemies of Islam; a the 16th century commission of the ‘Hamzanama’, by the Mughal Emperor Akbar. Soni has worked, quite deliberately, in a style that fuses aspects of miniature painting drawn from Mughal, Rajput, Pahari and Safavid locution, depicting key events in the life of Christ. The paintings had a unique touch whether it was Mary dressed in a Kurta with chooridar pyjama (actually, could even be leggings) and Joseph and Christ wearing diaphanous muslin robes favoured by Mughal nobility (in the ‘Nativity scene’ and ‘Prayers at Gethsemane’ respectively); the anionic Islamic tile patterns of 'Jesus at the Temple' or, the ‘Baptism of Christ’ in a distinctly Asian landscape. These touches lent insight into speculation voiced by the late architect Charles Correa of what Christianity would have looked like if it "had not been headquartered in Europe, but stayed in Asia, where it originated." Correa made this point in relation to architecture and ‘church topography’ within the perspective of the Salvacao Church, which was built for the Archdiocese of Bombay in 1977, but it opened up possibilities of engagement, specifically within the location of Christianity in Goa. Whose rituals and feasts are peculiar to the region, arising from the fervour of conversions spearheaded by St. Francis Xavier to bring in the flock and with Jesuit interventions to sustain the worship of converted Hindus by incorporating many local traditions and ideas. 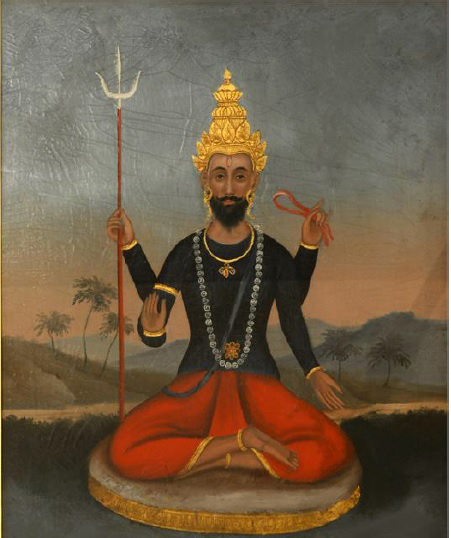 Contrasted with the lushly detailed Issanama in Indo-Persian style, was the ‘Christ Series’ by Vishwanath Nageshkar, a painter of Goan origin. His angst-ridden, austere palate of watercolours with near total elimination of detail, conjured inner torment expressive of the Norwegian painter Edward Munch. In ‘Divine Light’ (1950), a curiously creative feature of a long-armed hand akin to a shaft of light, presumably the hand of God, reached out to lift the figure of Christ, encircling his body in the clasp of fingers and palm. Antonio Piedade da Cruz (mid 1950’s) at Adil Shah Palace, rendered the same theme in a more conventional representation of the figure rising up into the light, enabling one to glimpse the freedom with which themes on Christ have been developed. Hoskote also includes church furniture such as alms boxes and portable altars (Adil Shah Palace). 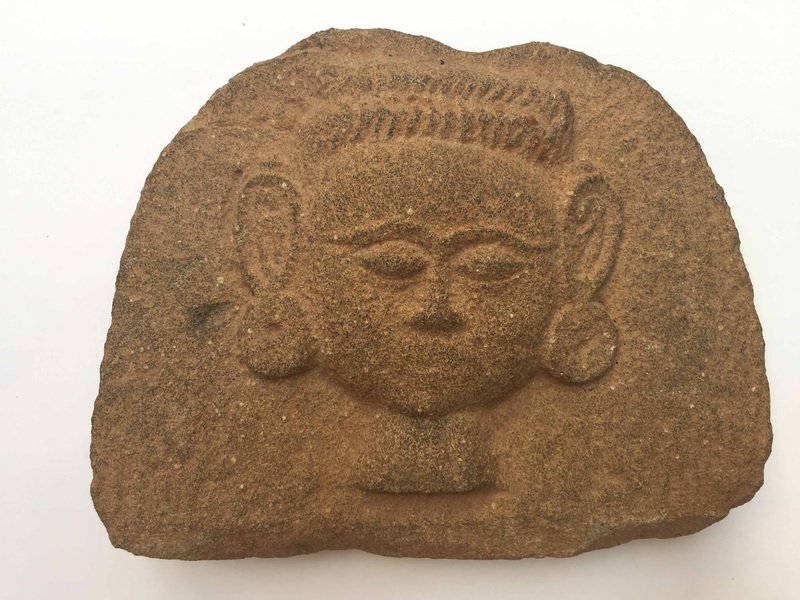 As well as icons of the Virgin Mary crafted by local, Goan artisans who, in reproducing objects brought by the Portuguese inevitably imbued them with their own cultural and aesthetic sensibilities. Altogether making for a rich tableaux of expression centring on the era of Christ. The imagery was supported with extensive texts, but unfortunately one could merely grasp an ounce of the scholarship behind such a collation, as one ambled through the visually engrossing arrangement. The video with Soni and Abhraham describing the process of conceptualising and making the ‘Issanama’ series was most informative, especially with details of how the pigments are sourced, ground and applied. As also the unusual layered canvas of paper and fabric carefully devised to ensure the many appllications of pigment are received and absorbed, enabling fine detailing with the squirrel hair brushes still in use by this school of painters. 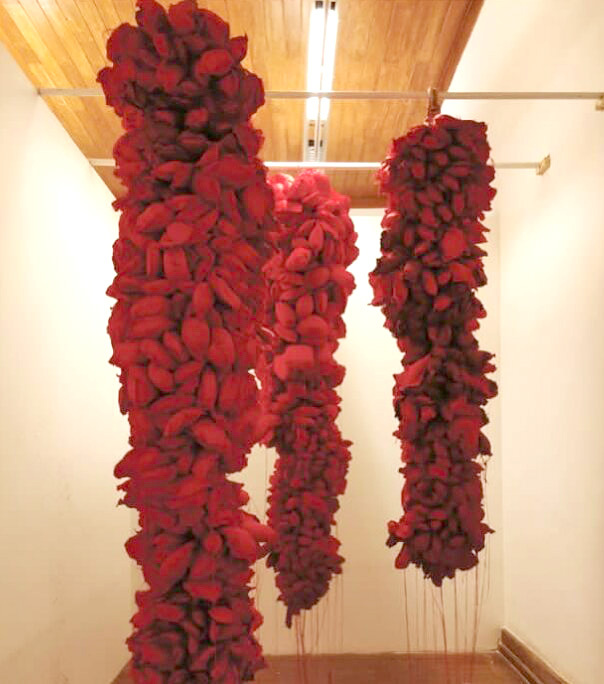 Tucked in a small corner, behind the elegant ‘Issanama’ display was ‘The Holy Rosary’ conceived by Mumbai based book-artist Priya Pereira, as pages of a miniature-sized manuscript loosely held together with a thread - the moveable sheets akin to its beads. And, precious few water colour paintings by the legendary twentieth century artist Angelo da Fonseca. A pioneer of the Christian cultural renaissance in Goa, he painted Christian themes in Indian settings with the Konkani Madonna in swarthy skin-tones wearing a sari. Born a Hindu, I grew up in an Irish Catholic convent boarding school and whether it was music exams or ISC Board exams that I asked for success in, it was the school chapel one went to pray. Attending mass with the nuns at 5 am, we may have sung along with Christian hymns, but we didn’t receive the sacrament and I don’t recall praying to Christ. God was God or Bhagwan, neither Jesus, Krishna, Shiva nor Rama, and prayer was prayer, regardless of religion, temple or church. 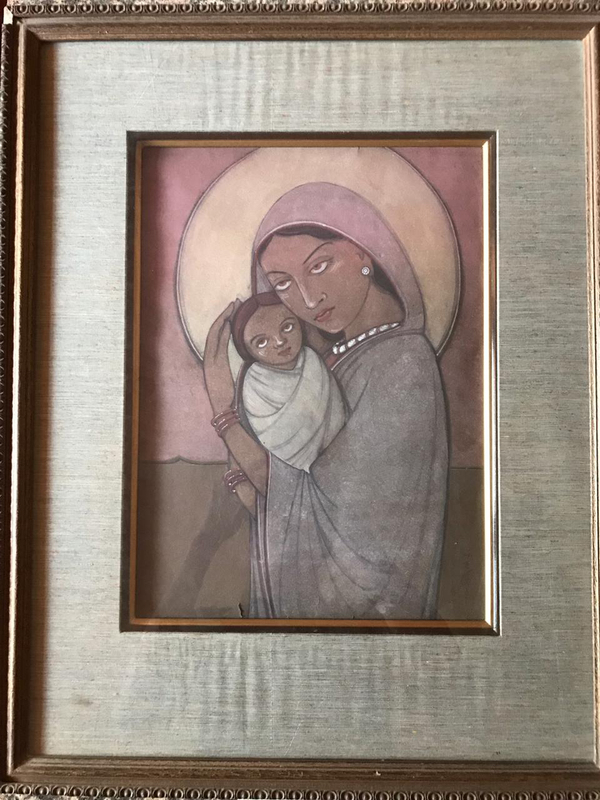 The idea of an Indian Madonna seems perfectly in keeping with this and befitting in view of the many other adaptations that pervade Christianity in Goa. A cultural shift that would be entirely legitimate for a Goan Christian. Neither an intellectual construct nor the subconscious influence of crafting fingers infusing the subject matter with a deeply rooted sensibility, but a profound grasp of the divine and its physical manifestation in the likeness of self. 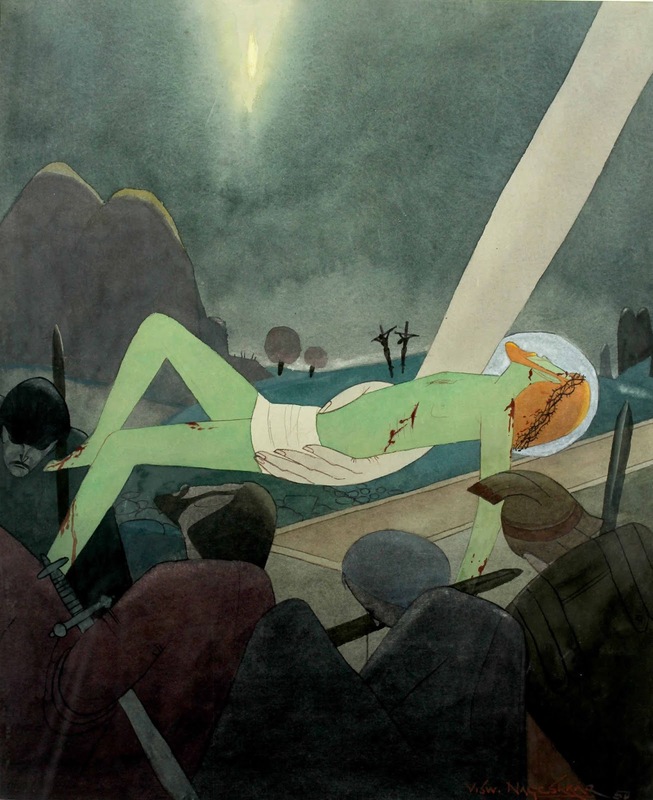 Though much criticised for this ‘offensive’ depiction in the first half of the last century, Fonseca’s work which epitomizes a cultural amalgam of religion, becomes one of the hallmarks of Hoskote’s curatorial commentary critiquing the politicising and owning or disowning of religions without much thought to the very concept of faith and the impartial divinity that enjoins us all. Maybe it was the space in which I viewed these works and the relatively blank mental state that absorbed intricacies and minutiae which enriched the looking; perhaps renditions of Christ within a centre of Christian worship brought in an element of veneration, but this was my favourite gallery of ‘The Sacred Everyday artefacts. At the Adil Shah Palace, I felt intimidated by rooms leading to more and more rooms filled to the brim with works that ranged from calendar art, to colonial water colours, the Bengal school, Kalighat paintings, Jain and Tantric interpretations as well as sculpted Goan Gram devatas, Saptamatrikas and more Christian art, alongside modern paintings, contemporary art and installations. And I know that I didn’t do justice to the works exhibited. It really was too much of a sensory overload. 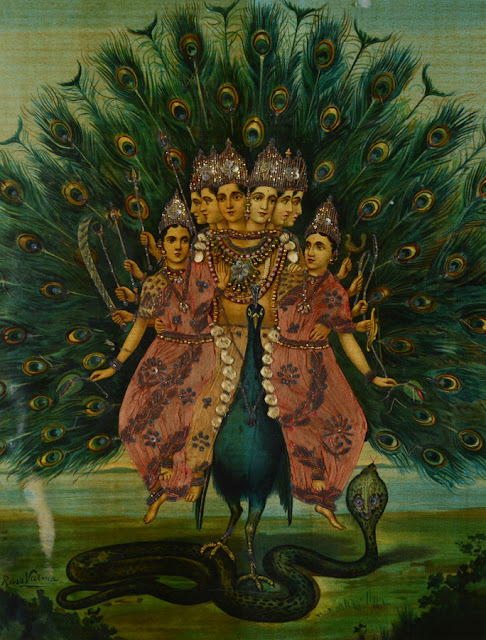 But even so, a few works stand out and though not a fan of the Prince of Travancore’s oeuvre, I was enchanted by the way textiles had been used to embellish the oleographs by Raja Ravi Varma and the many schools inspired by him, that were on display. Hoskote tells us that when “Ravi Varma democratised worship in India by bringing religious iconography within the reach of the masses, he also changed the contexts within which people engaged with gods and goddesses” enabling them to create a puja room or altar at home, using prints bought in a store. And, the impulse to adorn, interestingly, arose from the credence that ornaments which embellish and add beauty also protect the body from inauspicious elements. It is likely these creative additions were the work of household women who owned the prints, though they could have been the work of a cottage industry which employed women to decorate them. 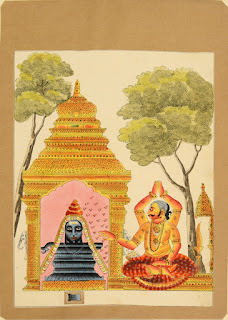 The 3-D facet that these prints acquired through the use of fabrics, sequins, beads, salma-gota and such-like, evoked a hint – and just that, of the elaborately ornamental Thanjavur painting tradition, with its essentially devotional themes and inlay work of glass beads and semi-precious stones. 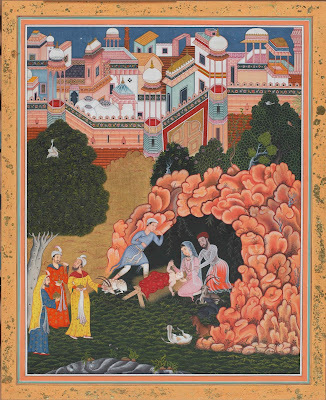 Other lesser known, but illuminating art-works were Chinese-style paintings (Swaraj Art Archive), a result of a flourishing Opium trade between India and China, during the 18th and 19th centuries. With Europeans settling in and around Canton, Chinese artists familiarized themselves with Occidental physiognomies and evolved a hybrid characteristic, later employed for reverse glass paintings depicting portraits of Indian royals, courtesans and dancers. This mode of art apparently found its way into palaces and abodes in Kutch, Mysore, Indore as well and collections in Bombay. 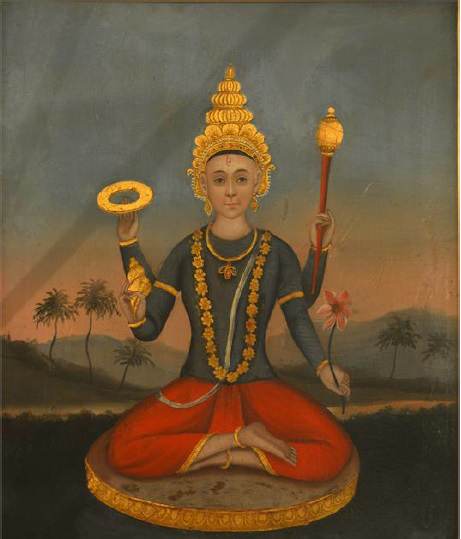 Here, Devi, Shiva and Vishnu are not presented in familiar avatars but, as with the Madonna icons (Church of Santa Monica) that were infused with an Indian aesthetic, these figures had a distinct Chinese touch. And, reiterating the use of diverse influences in Manish Soni’s ‘Issanama’, attributes had been culled from Rajputana and Gujarat, Mughal courts as well as South India. In these fascinating depictions, Devi looked more like a princess than a goddess, Shiva was more benign than the familiar ascetic and intimidating destroyer of the universe, and Vishnu was certainly of mixed parentage (Chinese and Indian). 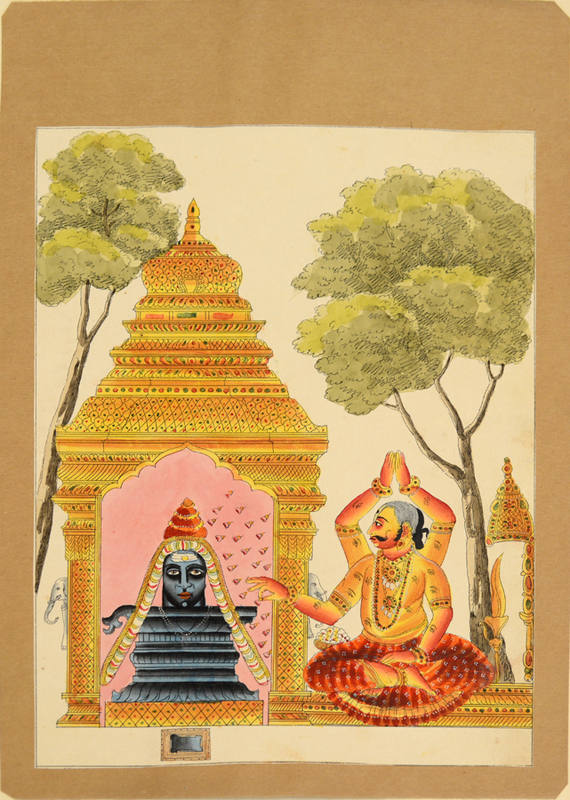 What was evident in these portrayals was the detachedness of the painter, who was clearly not in awe of, nor a devotee of these idols. Without the impress of devout articulation these paintings assumed the quality of secular documentation rather than that of religious personifications. Chinese influences courtesy the Opium and other trade routes have continued, however sparingly, in the embroidered Parsi Gara and other textiles such as the famed Tanchoi silk brocades of Benares. 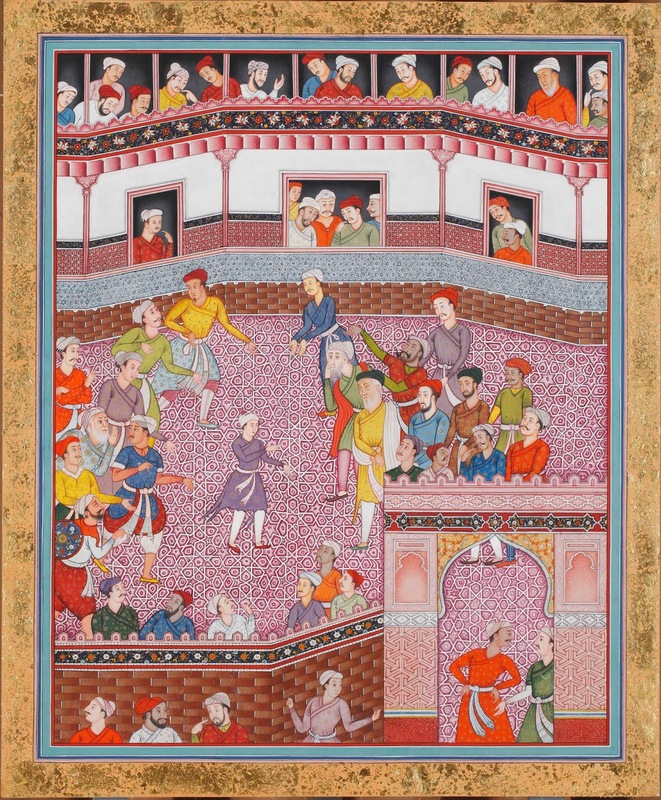 But regrettably, this Occidental-Chinese-Indian style of painting declined after the first Opium war (1839-1842). 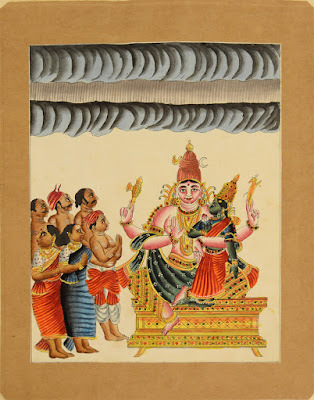 Leading from this, via the many manifestations of ‘Calendar art’, one came across ‘The Keith Gretton Album’ (Swaraj Archive) featuring a series of small scale watercolours based on the ‘Thiruvilayadal Puranam’ - a series of devotional stories around Shiva and his presence in the mortal world, apparently to test his devotees. 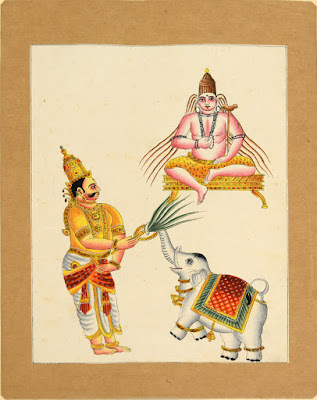 Written in the 16th century by the saint Paranjothi Munivar, it incorporated vernacular legends and tales that formed part of the Skanda Purana attributed to Rishi Vyasa. These were done in Company-style painting, similar to the ‘Trichinopoly Album’ (Swaraj Archive). 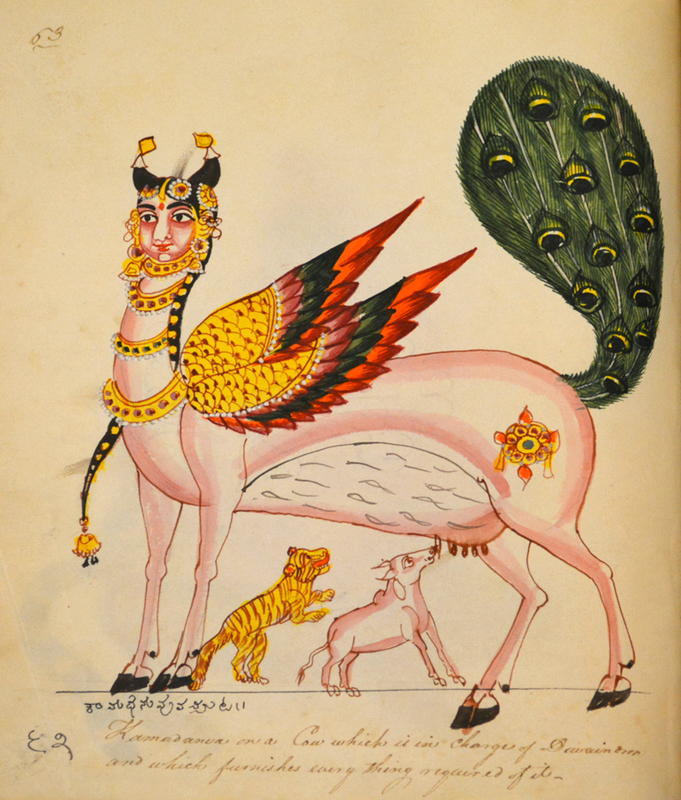 The latter featured ‘Kamadhenu’, the wish-granting cow, in iconography that excerpts from the Buraq or Celestial horse of Islamic legend, Krishna floats on a banyan leaf and other gods and deities are featured in a “narrative that is as cosmic as it is domestic” as well as visually and ideologically interlinked through differing systems of belief. Seeing these and other such diverse works on adjoining and adjacent walls, room after room on the first floor of the summer abode of Adil Shah of Bijapur constructed in 1500, and now Panjim’s oldest surviving building, history saturated the spaces between the art works permeating one’s soul. There was so much to learn, so much that one had missed seeing and making connections with. So much more to look back and glean from. Art, for me, is never just an ocular experience. Studying an assemblage of this scale and dimension, notably with a subject matter that is at the core of being, there is a simultaneous interrogation of one's own practice and understanding, religious upbringing and values and how they translate into the present: of how the exposition informed and expanded the parameters of comprehension of such matters. There was history, there was a storyline in text and in the pictorial as well as juxtaposition of images and evidences that had the possibility of redefining and relocating pivotal convictions. Even if one doesn't see with that intent, the very act of viewing itself, is capable of altering perspectives. The questions that arose pertained to the scope this kind of curatorial register had, if it was merely preaching to the converted, of what kind of audience this exhibition had attracted and where would it's most influencing scope lie. Thus ruminating one was confronted, quite unsuspectingly, with a burst of contemporary art. And, I was stunned into acknowledging the present with a jolt. The blood red of ‘Hibiscus River’ by Smriti Dixit, assaulted with its visceral blobs of magnified bloodshot globules descending from the ceiling. My response was to step back. I was struck, as if by a bolt of lightning, by its bold, larger-than-life, graphic exploration of the female menstrual cycle. 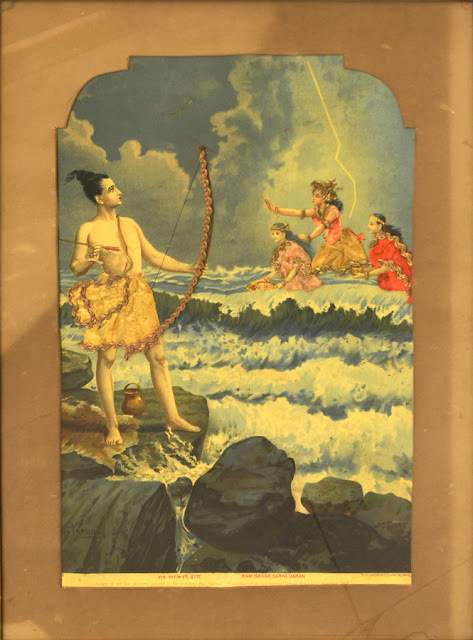 In her letter accompanying the artwork, Dixit brought into site Kali and Durga whom she asserts are too far from the earth. And they are, quite simply, because women are squeamish in accessing the powers these goddesses epitomised. Her installation amplified her outrage that these volatile and powerful female deities of the Hindu Pantheon are far removed from the context of devotion they were created in. Pertinently so, within the bounds of the present epoch of an “ effectively patriarchal society” which interprets women undergoing the hormonal cycle as unclean for worship in temples. Even as I did take a step back and walked away at first glance, I retraced my steps to confront my own practices and memories surrounding the monthly menstrual cycle, when my sisters and I would take turns to light the diya and do the aarti in mummy’s mandir at home, on the days when she was ‘down’. This was up until the mid-1980’s which was not that long ago. And the complexity of the on-going Sabrimala debate on barring women from entering the temple premises was heightened with this illogically ingrained dictum that had been and probably still is integral to puja in other households too. Where, Dixit’s indignation expressed in textile, fruit, metal and poured paint, compelled one to think again and accept how we are complicit in such ideas being carried forward at a personal level, without due probing. ‘Hibiscus River’ was not an endearing work of art such as the many water colours and artefacts I had viewed until then. It whacks you fairly and squarely, and repulses. Some may walk away, some may brave the language of colour and form to examine their own involvement within the stated premise . I wonder how many did the latter, and how many departed from that corner, averting their gaze from its awkward truth; or in reviled incomprehension. 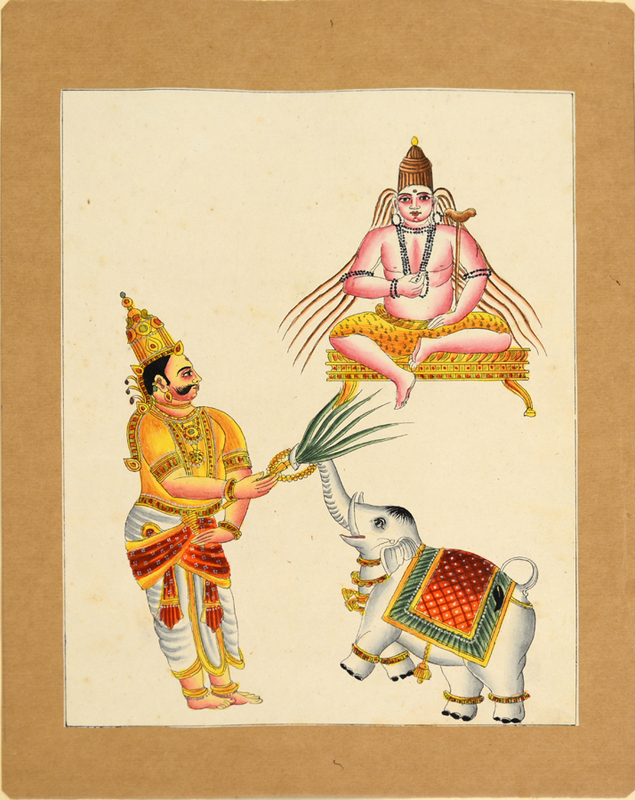 Woven in between myriad painted and printed compositions hung on walls - spanning centuries and across the topography of the country, below eye-level, were placed rugged and aging, greyish stone sculptures of Gram Devatas, Devis and Khandoba, a folk deity and kuldevata (family idol) of the Deccan region, also known as Mallari – vanquisher of the demon Malla, who was later adapted into traditional Shaivism as Martand Bhairava. 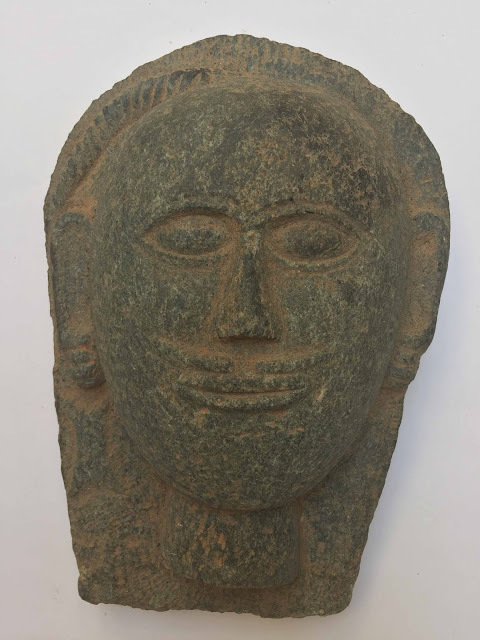 These sculptures (courtesy Goa State Museum) popped up in one’s optical field like sentinels, causing one to pause if not always to reflect. 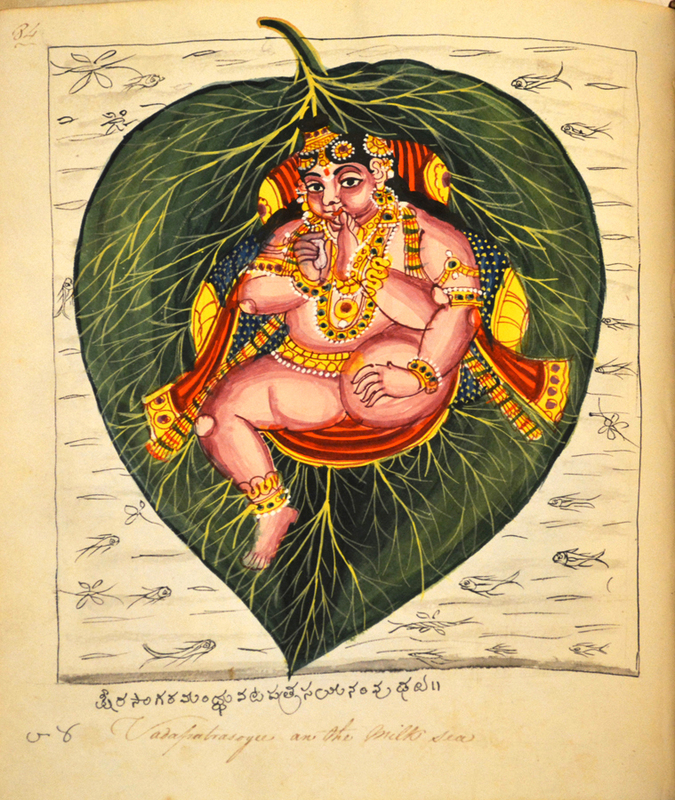 In re-imaging these deities who were guardians of health and prosperity, of the home, fields, water sources and forests, originating with the worship of Yakshas - the benevolent but occasionally mischievous caretakers of the natural world hidden in the earth and tree roots, or Kshetrapala - a god of the farmland, one pondered the genius and practical nature of such worship in an agrarian culture. As also the fluidity of religious icons from one sect of Hinduism to the other, signalling that nothing had been rigidly sacrosanct, but an on-going amalgam and adaption which forms the core values of any tradition anywhere in the world. Added to these were figures from the cult of Saptamatrikas or the Yogini cult – of seven mothers as shakti or female counterparts of a male god (where Brahmani is wife of Brahma and Maheshwari of Shiva). With this constant churning of the eye and intellect, doubling back and forth with religious histories and their visual intersections, Hoskote recreated a complex tapestry illustrative of manifestations of faith across philosophies and expressions of belief, exemplifying that the sustenance of an iconography or system of worship is ever-changing and emphatic propriety cannot be dictated nor imposed. 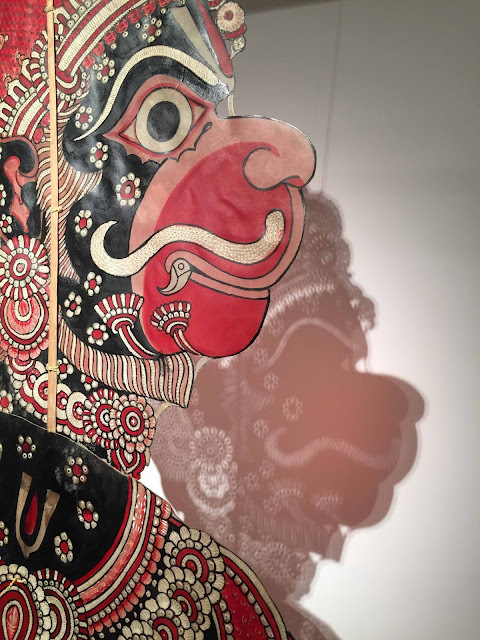 The curator also brought in shadow puppets or Tholubommalata – the leather puppets of Andhra Pradesh (Sarmaya Foundation). These captivating life-sized puppets used in performances of the epics, prospered under the rulers of 16th century Vijayanagara. And, were reportedly popular until about sixty years ago because farmers believed that a performance of the Ramayana had the power to call on the blessings of the rain god. Made from skins of the goat, deer or buffalo which were beaten to a film of translucency and coloured with pigments, with strategic holes that appeared as jewels during a performance; this novel art steeped with the power of faith, dwindled with the onset of travelling cinemas making their way across rural India. 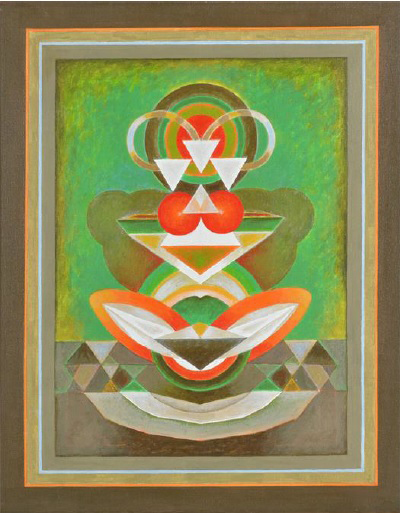 And, there was still lots more - from Gulam Rasool Santosh’s canvasses awash with Kashmiri Shaivism and Tantra, to Sacred Geography. 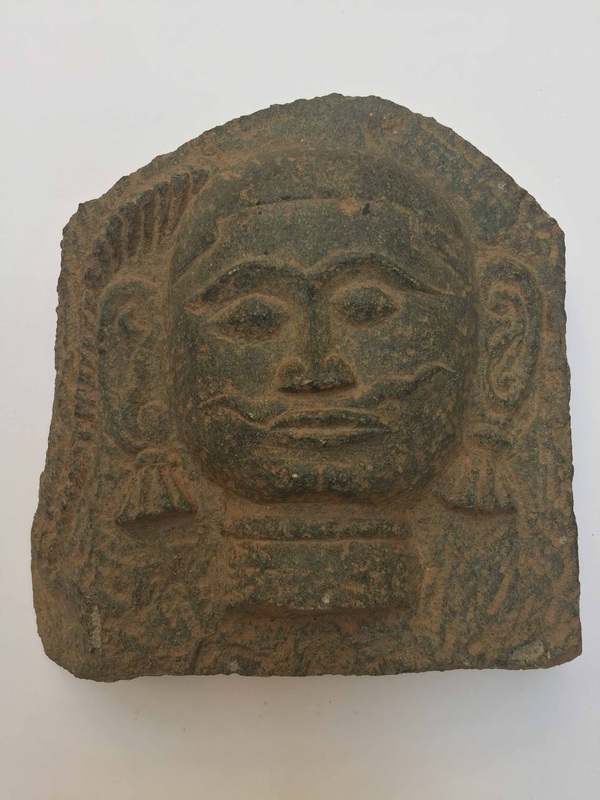 As well as Tanta-style art - of contemporary paintings made by anonymous artists in Rajasthan, which included masks and mantras, devised by these centres of production to appeal to tourism’s interest in the cult of the exotic. The more one looked the more there was to enthral and link with, but it was becoming impossible to compute. An exhibition of this scale of knowledge needs to be repeated and shown across the country, perhaps in smaller sections as separate events, elaborating on the varied elements of religiosity included here. Although the salient, yet unconventional and unorganised features of worship; quirks of modelling and re-modelling faith and how inventive and progressive devotion and the devotee was and can be, do permeate the narrative, one’s evaluating tended to get weighty and unwieldly. Therefore, more comprehensive presentations would be more accessible and informative for the relatively casual observer. Especially within the context of a multi-disciplinary event such as The Serendipity Arts Festival. Human dedication to the forces of being, however we image them, is a very personal and intimate affair. Whose systematizing is impossible, most especially, in our age that celebrates the individual. Therefore, such a revelation of diverging ideas hallowed through and highlighting the concept of creativity itself, as embodied in various forms of art, is crucial information in our currently fraught environment imbued with exceedingly fragile notions of faith that threaten to engulf us in our unknowing. In the work of the young contemporary artist, Youdhisthir Mahajan of Nepal, we saw a very interesting analogy that could speak well for the institutionalization of religion. He explored the material specifics of language, exploiting the texts at a “molecular level”. In responding to titles of books or stories within books bought at thrift stores, Mahajan turned legible language into dense blocks of mark and texture, rendering the book and its otherwhile familiar content “frustratingly illegible” and therefore meaningless. In thus questioning the institution of language – its process of mark-making and meaning, he could well be challenging the same in the ethics of organized religion with its obfuscated formalities and dogma. 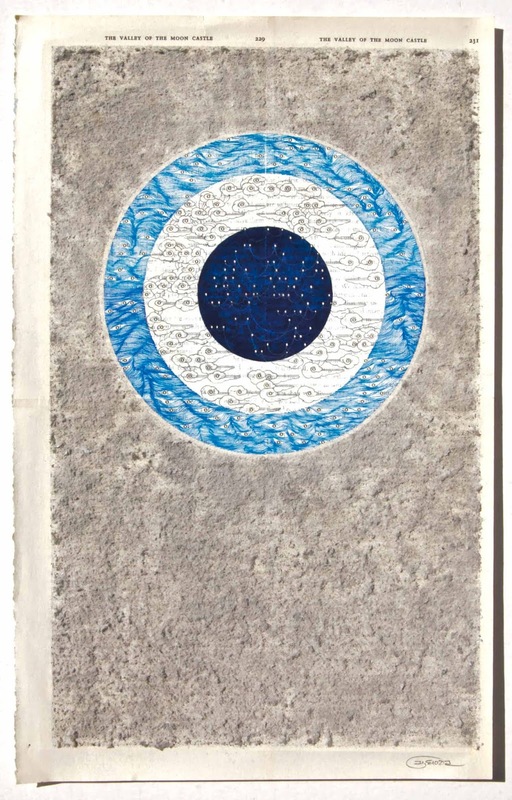 Before I close, I must mention another work by Smriti Dixit. In a quiet corner behind her passionate ‘Hibiscus River’ was one more installation, which to me was the essence of devoutness, such that Coomaraswamy noted and wrote about extensively in reference to the ancient art traditions of this country. That interplay between the sacred and the everyday – where worship was not necessarily a ritual but the work of the artisan was his ceremony of veneration. ‘Yatra’ is poignant with layers of memory, of questions, of wishes and stories. Innocuous anecdotes about an ordinary day in the artist’s existence which has the capacity to become extraordinary through her inner rendering, externalised as art. 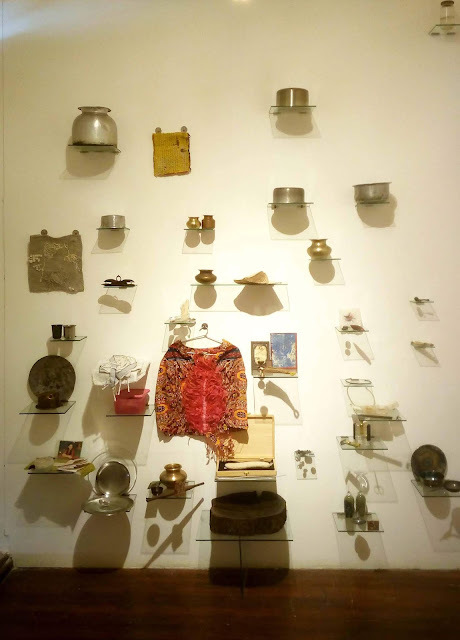 As if drawing from the quintessential karma yogi who pursues profession as a means for self-knowing, Dixit creates an arrangement of everyday objects – relics of a biographical path. And, in its simplicity lies the essence of reverence one also caught a glimpse of in the locally crafted Goan ‘Gram devatas’ and ‘Devis’ - uncomplicated, immersed in the authenticity of a physically manifest reality and something which cannot be ritualistically structured. Back to back with ‘Hibiscus River’ we thus saw two opposing facets of the artist, echoing qualities of the quintessential woman as both volatile and benign. In keeping with the various facets of the feminine deified as Devi, Durga, Parvati, Kali, Lakshmi, Shanta Durga and her other avatars. For this afternoon of viewing, the rooms of Adil Shah’s palace took on a character akin to halls of worship. For one could not negotiate icons of veneration and art-works provoking and questioning concepts of faith, without imbibing a sense of the piety through their expressions of an inner quest, not unlike one’s own. Yet, it didn’t have the same quality of silence, absorption and reflection that was facilitated at the Church of Santa Monica. In some sense this characteristic and its contrast, intensified the dialogue within, as also the awareness of how religion fails when the setting changes, when it becomes befogged in time or incomprehensible with overtly intellectualized assertion. Just as art does, without the capacity for involvement with self-discernment – the very basis for art-making and viewing that render it sacred. reviews and articles by gopika nath. Watermark theme. Powered by Blogger.